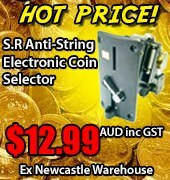 Our range of coin mechanisms (or mechs) for sale in Australia is great for those wanting to upgrade their old cabinets, or, those needing to replace broken and faulty parts in their arcade machines! We have a variety of mechanisms for customers to select from, including mechanical and electronic mechs, as well as coin validators, and much more! 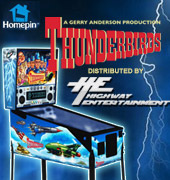 These are suitable for arcade, amusement, and pinball machines! We can ship all over Australia, and if we don’t have the mechanisms you’re looking for, we will do our best to find it for you. For instance, if you’re looking for a particular brand mech, but cannot see it on our list, then please send us an inquiry and we will try to find it for you. The Coin Controls C220B Electronic Coin Mech with Front Load / Bottom Reject is a United Kingdom manufactured coin mechanism and the unit comes with a 15 pin parallel interface and 5 pin serial interface. The coin mechanism can be programmed to accept eight different types of coins. The Coin Controls C220 Electronic Coin Mech with Front Load/Bottom Reject - Pinball Programmed is a United Kingdom manufactured coin mechanism. The unit comes with a 15 pin parallel interface and a 6 pin serial interface. The coin mechanism is programmed to accept Australian Twenty cents, One and Two dollar coins for operation with Arcade Pinball machines. The Coin Controls C220 Electronic Coin Mech with Front Load/Bottom Reject - Arcade Programmed is a United Kingdom manufactured coin mechanism. The unit comes with a 15 pin parallel interface and a 6 pin serial interface. The coin mechanism is programmed to accept Australian Twenty cents, One and Two dollar coins for operation with Arcade Pinball machines. MS100 Top Load electronic coin mechanism. 4-Coin acceptor with a Positive Common Interface only. It needs a 12 volt supply, but will work with a voltage of between 10 and 15 volts. Peak operating current is 2.3A (at moment of coin acceptance). The acceptor has a 13 pin connector. MS100 Front Load electronic coin mechanism. 4-Coin acceptor with a Positive Common Interface only. It needs a 12 volt supply, but will work with a voltage of between 10 and 15 volts. Peak operating current is 2.3A (at moment of coin acceptance). The acceptor has a 13 pin connector. The Mars MS111 coin mechanisms series are 4 coin acceptors. The interface is Positive Common Interface only. The unit is 12V working (will work between 10V - 15V). The coin mechanism can be identified by its wiring. This coin mech is Top Load with Bottom Reject.